All I Need To Feel Normal is Zero Gravity! What else would I be doing at 7pm on a Friday night than going to the gym…. Ha! Some hope. But I did leave the house. 7pm tonight was my first session in the hydrotherapy pool. I wasn’t totally sure what to expect. I got into the water using a combo of steps & rails (helped by Mr Geek) into a swimming pool of slightly salty bath temperature water. I was handed a pool noodle to sit on to keep me floaty and I just toddled about moving like a normal human for AN HOUR. Oh yes. A whole hour and I bobbed, I floated, I paddled a bit and stretched out, then bobbed about a bit more, all the while listening to chilled music. It felt marvellous. Getting out wasn’t so much fun. I cracked and popped as more of my body left the water and the pain of normal gravity was a bit of a bummer. But on the up side, my appreciation for Mr Geek is far higher, having been lifted out of the water into a curtained changing room where he danced inappropriately at me & wondered out loud (too loud) if we should make Austin Powers style shadows just to highlight that not that much has changed. I also had a lovely chat with the hospital physio team earlier today who have decided that they want to pass me on to the pain management team (Whoop!). She also had a bit of a freak out session about me dropping 5kg in 2 weeks without being aware. Despite me assuring her that I really do have plenty of reserves and genuinely don’t mind if I drop a few more pounds, she’s made an appointment with the registrar linked to my GP, combining this with more blood letting & an ecg to work out why I wobble when standing. (Here’s a clue – I’m full of opiates and they make me want to hurl!). Tuesday is looking like fun fun fun! Exercising when your limbs keep trying to fall off. Moving isn’t just good for the body, but good for the head too. And frankly, I’ve been a grumpy sod for the past week or so. So, on the back of having rested the whole day yesterday, I insisted that we take the kids swimming at the local pool today. It’ll be fine, I said. They have stairs into the pool, I said. I’ll feel better, I said. So here it is in gif form…. Mr Geek wasn’t sure and was holding in all his internal fretting whilst the kids launched themselves bodily onto the giant pool inflatable. I was sat at the side, slightly annoyed as they’d taken out the steps I’d promised would be there. So once we’d discovered steps weren’t going back in, Mr Geek helped me off the crutches into a sat by the pool scenario and he lifted me into the water from there. (OK, can I get an “awwwwwww!”). Once in, I realised that even standing on the floor was causing sciatica and knee pain, so I sat on my pool noodle and bobbed about like it was a floating throne. Once satisfied that I wasn’t going to fall off and drown (I can swim, it just hurts), or try anything stupid like front crawl, Mr Geek went off to do a few lengths. I was left bobbing around kicking my legs around like a baby in one of those inflatable seat things (except my pool noodle is far cooler, and it takes core muscles of a god to balance! ). This was blissful. I was weightless & moving with only minor twingyness! Stuff started to ache after 1ish minutes, but not anything that indicated imminent death. Then the kids wanted to move to the “fun pool”. We needed to get out. The life guard had suggested the lift that resembled one of those theme park grabbing machines. I’m not ready for those looks. Too much attention. So between me and Mr Geek he lifted me back out of the water onto my bum, then picked me up off the floor. Getting into the fun pool was easier (proper steps & much warmer), but because I was exhausted by now and the kids had buggered off to the slides, Mr Geek and I just hung about talking. Without me realising he had positioned me onto his leg and just held me in a sort of floaty position in the water. I was totally relaxed. Finally, the kids were done. Sadly, so was I and couldn’t actually walk back to the car, so Mr Geek helped me change and grabbed the chair from the car. As soon as we got home, I got (OK, I was helped into) a hot bath & assessed the damage. 1 hour of happy floating = both knees complaining behind the patella, my right elbow popped back in (Getting out of pool 1 required me lifting myself), my right shoulder making weird noises & shooting pains down my arm and both wrists sore & crunching. Mum, your roller skating is epic! Oh yes. Saturday has officially become family day. We will no longer spend the day deciding what to do, ending up actually spending half the day slobbing out then spending a fortune on soft play because of our lack of inspiration. We will have a plan. We will spend rime together. We will have fun! It turns out that now we’ve swapped our gym membership from the posh club to the local council run one (half the price, but way more child orientated), we not only have unlimited swimming and the kids swimming lessons included and entrance to the local soft play, we also have the weekly roller disco included! Over the past few weeks, we’ve stepped this up a notch by taking the kids to the roller disco, which considering my advice to avoid any kind of impact sport perhaps is a little foolhardy, but as long as I don’t fall over, I’m good. Actually, I’m more than good. I’m having a total ball. This has in a few short weeks taken me right back to going to the roller discos at our assembly hall as a teenager and racing around on skates trying to impress the boys. And to top it off I’m doing something that has totally impressed the kids – they never knew mummy was a skater (I’ve not mentioned that I learnt to skate fast because as a drunk teenager, you don’t care when you fall over after getting air over the speed bumps in the road….). But this time, we have the added bonus of it returning my legs back to me from the wibbley mess that they have become. In the past year, the lack of movement combined with some serious comfort eating have not done me any good. The gym is not my friend – I dislike the walking balls of testosterone that gaze lovingly at themselves (and each other?!) as they lift heavy things and make faces, I equally dislike the twiglet women who spend hours on the stepper and clearly spent their school life playing netball or athletics. To add to the excitement this week, I bought my first pair of roller skates since I was 14. 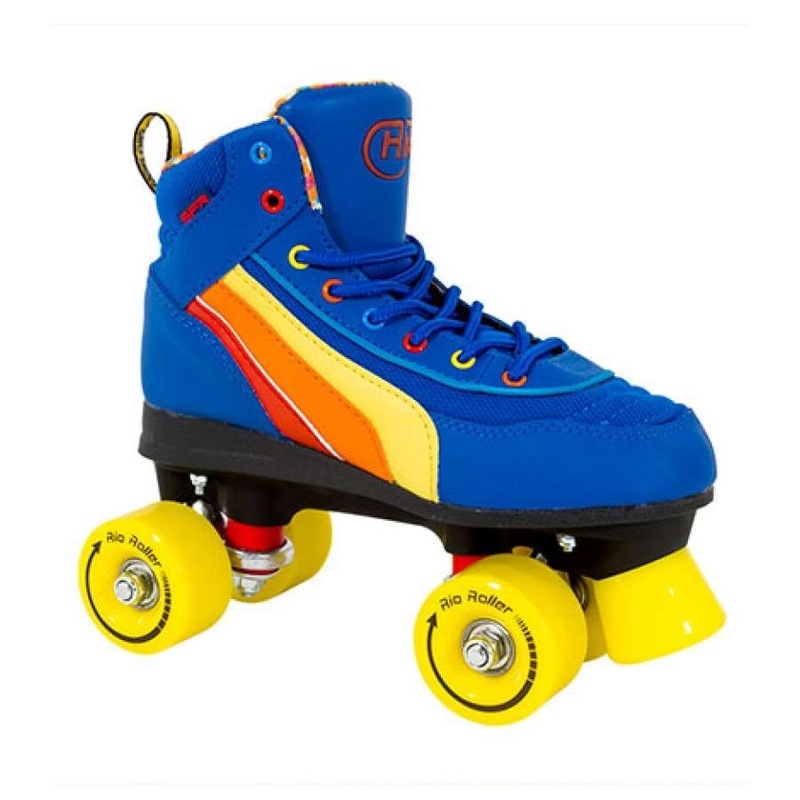 Not the roller blades or quad skates that the kids now have with big plastic buckles and shell, but bright blue retro 80s skates. Comfy skates with laces. Skates with bright yellow wheels. Just looking at them makes me happy.